Ever since contact lenses became available in the 1950s, optometrists have theorised that it may be possible to mould the shape of the cornea. For example, optometrist Newton Wesley coined the term “Orthokeratology", and, in the early days, this treatment required multiple modifications over a period of months and results tended to be unpredictable. It took another 20 years before manufacturing technology was able to make computer-guided gas-permeable reverse geometry lenses. This process was pioneered by Richard Wlodyga, OD. Originally the lenses were prescribed for day-wear only but from 1993 onwards wearing the lenses at night started to become popular. 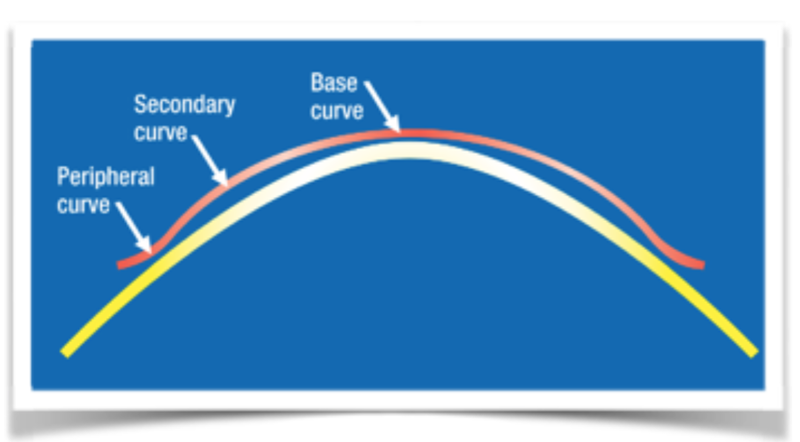 The Jessen formula was named after George Jessen in the 1960’s He was the man who designed the first Ortho-K lenses upon which most Ortho-K lens designs are now based, and his formula assumes that there is a linear relationship between myopia reduction and base curve selection. In other words, if the cornea had a flat K reading of 42.00 Diopters and a Rx of -2.00 D, a 40.00 D base curve would be fitted. This would change the corneal curvature and, therefore, the refraction, by the required amount. Ortho-K lenses do not work for corneas that are very steep, very flat or very round. In addition, there are unknown factors that may affect the outcome. These may vary with each individual and include the rigidity of the cornea and the degree of interaction of the eyelid. Therefore,success is not guaranteed. 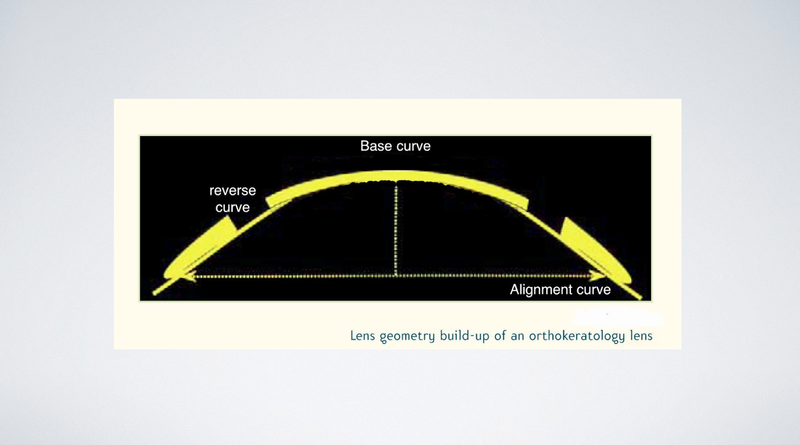 Orthokeratology (OK) lenses are a mechanical process that seeks to mould the cornea into a flatter shape and alter the focusing ability of the eye. Special custom-made hard lenses are worn at night to achieve this. Clients must be carefully chosen, and lens selection needs to be tailored to the specific client with the use of mathematically based measurements and calculations. Topographic measurements are required for the examination as well. The corneal epithelial (uppermost) cell layer was redistributed in some manner, leading to a thinning of the central cornet to significant levels across the corneal surface. There was concurrent thickening of the mid-peripheral cornea, particularly in the stromal layer. The hypothesis is that a thin layer of tear film exists between the back of the Ortho-K shaping lens and the central cornea. These tear film “shear” forces act hydraulically to compel a compression and possibly subsequent redistribution of the very anterior (upper layer) epithelial cells under the shaper lens from the centre toward the periphery. This seems to refute the theory that Ortho-K lenses bend the cornea. These changes occur with no apparent change to the posterior cornea curvature. It was the corneal epithelial cells that were affected in some manner by the fluid pressure effect of the tear film force. The cornea is estimated to be approximately 540 microns in thickness or about 0.54 of a millimetre. In comparison, a human hair is approximately 50 micros in thickness, the same thickness as the human corneal epithelium. Therefore, the gradual redistribution of corneal mass in orthokeratology that takes place under the shaping lens is what accounts for the reduction in myopia. 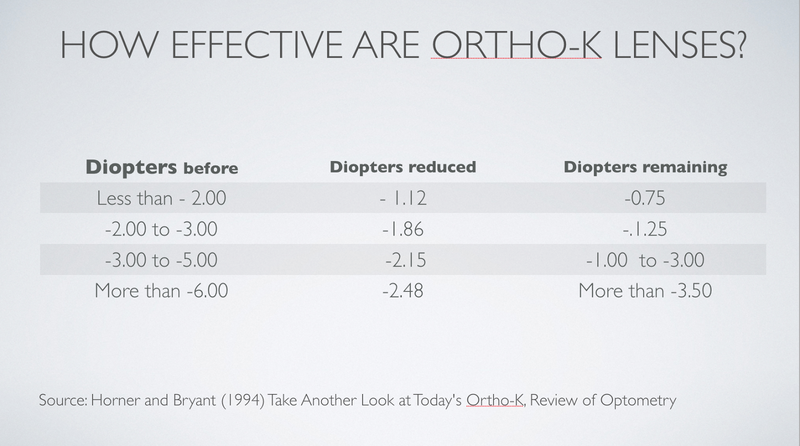 How effective are Ortho-K lenses? Research done by Carkeet, Mountford and Corney shows that the amount of myopia reduction depends on how much myopia there is to begin with. Good responders achieve a myopia reduction of up to 1.50 Diopters andmedium responders achieve a reduction of between 0.75 and 1.50 Diopters. The above studies indicate that the myopia is only partially reduced and the wearer will still have some myopia that will gradually increase during the day. So it may be necessary to wear regular contact lenses or glasses later in the day, for example, if the myopia is in the middle range between -3.00 and -5.00 Diopters. The studies show that a person can expect to have a -2.00 Diopters reduction in myopia, leaving -2.00 Diopters at best, to most likely deteriorate a further 0.50 Diopter during the day. Therefore, the improvements that can can be expected with Ortho-K lenses are not particularly impressive. The old type of Ortho-K lenses tended to cause “with-the-rule” Astigmatism because the centering was often too high. With modern multi-curve lenses the Astigmatism reduction possible seems to be 1.50 Diopters of Astigmatism “with-the-rule” and 0.75 Diopters of Astigmatism “against-the- rule”. 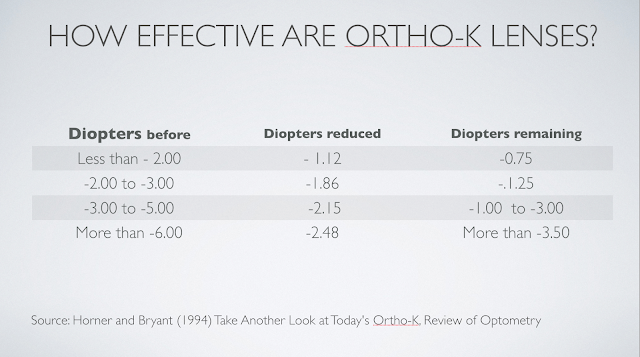 Virtually all studies agree that myopia reduction with Ortho-K lenses is only temporary. In fact, Ortho-K lenses are described as “Corneal Reshaping Treatment for Temporary Reduction of Myopia.” In other words, the effect lasts as long as you wear the lenses but when you stop wearing them the cornea slowly reverts back to what is was before. This process may take anything from 20 hours to 95 days and the longer the Ortho-K lenses have been worn the longer it takes for the cornea to fully revert back to normal. Do Ortho-K lenses prevent myopia progression? The claim that they do is one of the sales arguments put forward to convince people to invest their money and time in buying these lenses. Myopia is not caused by the cornea and, therefore, reshaping the cornea will have a minimal effect on the forces that actually cause myopia. In the same way that laser surgery on the cornea does not guarantee that your myopia will change, wearing Ortho-K lenses only reshapes the cornea with the effect that your vision improves. You still have the same myopia, only flatter corneas and the environment that causes myopia, such as extensive near- work, is still there. First of all you need to invest somewhere between US$1,500.00 and $2,400.00 for the OK lenses as well as spending three months visiting the optometrist. After that, there are ongoing expenses for the replacement of lenses, cleaning fluids, etc. You also need to be extremely dedicated to the preparation of the lenses for wear, placing the lenses on the eyes as well as removing the lenses in the mornings. Cleaning and storing the lenses is even more work. The care instructions typically cover two pages or more. 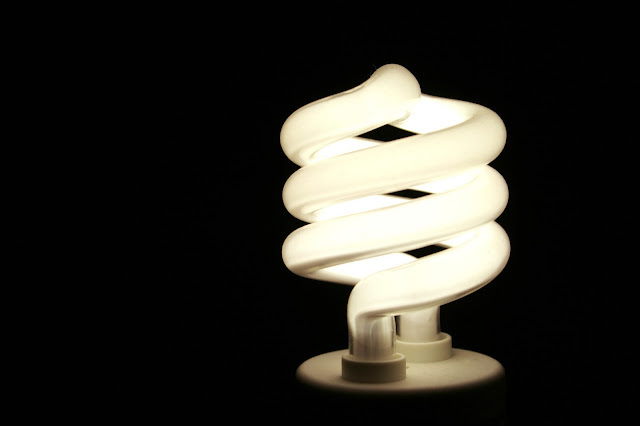 "The general public must be aware that overnight OKL wear is non- physiological and may be associated with very serious and visually significant complications. The promise of good eyesight without much effort is a very attractive idea for many parents with children starting to show signs of myopia. Also, the amount of money involved may tempt some practitioners to avoid full disclosure of the potential consequences. 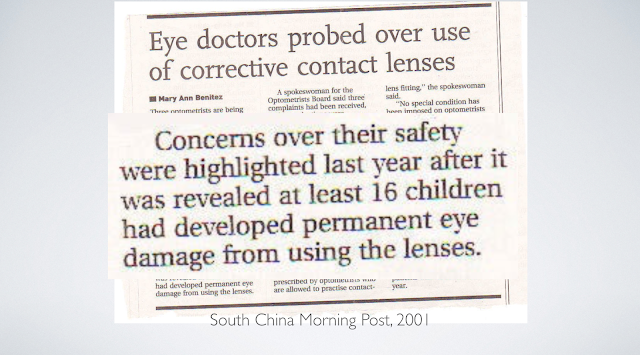 In 2001 there was an alarming rise in infection due to the wearing of Ortho K lenses, especially in south-east Asia. For example, at that time, the South China Morning Post reported that 16 children in Hong Kong had suffered permanent eye damage due to the wearing of Ortho-K lenses at night. The government then stepped in and enforced more rigourous training of optometrists. Until recently there were no regulations covering optometry practice in Taiwan. In Hong Kong they were introduced in 2004 and in Singapore in 2007. The American FDA requires optometrists to undergo extensive training and certification before they are allowed to sell and fit Ortho-K lenses. The patient must be fully informed of what is involved, not only of the benefits but also what is required to keep the lenses and the eyes clean. If the optometrist does not take the person‘s mental health, maturity, hygienic and other factors into account before fitting Ortho-K lenses, that person could face very severe consequences. The actual fitting process has to be done by specially trained optometrists, because incorrect fitting can cause problems such as centration. This is when the lenses are not fitted properly and bubbles form under them. For example, research shows that corneas with a prorate shape (steep in the centre and flat in the periphery and moderate curvature (46.00 to 44.00 Diopters curve) seems to respond best to Ortho-K lenses. 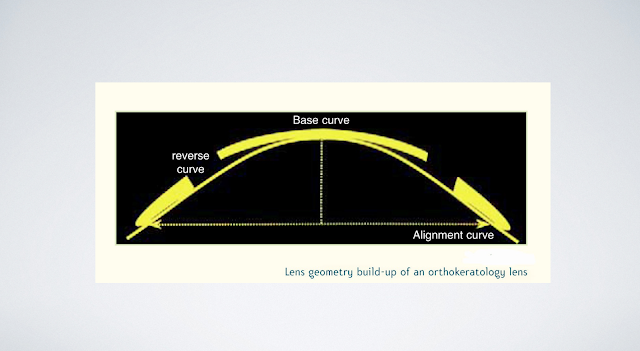 Corneas with flatter curves (36.00 to 39.00 Diopters) are thought to be less suitable for Ortho-K lenses. Ortho-K lenses are not suitable for people with more than -5.00 Diopters as well as those with more than 1.50 Diopters astigmatism and those with pupils more than 6 mm in diameter. People with insufficient tear quality are also not candidates for Ortho-K lenses, since the amount of corneal staining (the corneas‘ response to contact lens wear) may rise to unacceptable levels. Individuals with dry eyes should never be fitted with Ortho-K lenses. Chronic lens binding can also cause severe corneal staining. Because of the binding issue, which is when the lenses stick to the eyes, the FDA has only approved a few types of Ortho-K lenses for general use. In addition, the exposure to preservatives found in the contact lens cleaning solution is increased since the eyes are closed while the lenses are worn. Other side effects that may occur are extreme discomfort (there is something in the eye), redness, irritation, discharge, corneal abrasion and distortion of vision. The most common side effects are corneal edema (swelling) and corneal staining in addition to corneal scarring, decreased vision and, more seriously, infection of the eye, corneal ulcers, iritis, and uveitis. Uveitis is inflammation of the uvea, or the middle layer of the eye. The uvea consists of three parts, the iris, the ciliary body, and the choroid and inflammation in any of these three structures is termed “uveitis”. Another side effect is neovascularisation, excessive growth of blood vessels from the limbal vascular plexus into the cornea, caused by deprivation of oxygen from the air. A common problem is that the lenses stick to the cornea and must be released upon waking, either by applying eye-drops or by squeezing the eyeball so that the lenses pop out. This procedure often leads to infections, because there is a tendency to inadvertently touch the eye. Some doctors refuse to fit Ortho-K lenses on children less than 14 years of age due to the higher risk of infection. Younger children are not motivated to follow the rigourous cleaning and maintenance routine needed for the safe use of Ortho-K lenses. The number of reported cases of serious infection is rising again, especially in children living in China and south-east Asian countries. In Europe the infection rate is much lower because the lenses are not generally sold to children. Compared to natural Vision Training, the fitting of Ortho-K lenses does not seem worth the effort and expense. Also, Vision Training offers a more permanent result and is a lot cheaper. The only drawback with Vision Training is that you have to do the exercises often enough to obtain significant results. Children with less than -2.00 Diopters need to do Vision Training for a week or two at the most. Then the child will have perfect eyesight, that is, he/she will be able to read the bottom line of the eye chart which is 20/16. In other words, the child will have better than 20/20 vision so all the risks, the fiddling around with cleaning fluids, etc., will be forgotten. Vision Training is permanent – OK lenses are temporary, cumbersome, costly and may potentially cause serious complications. If your child already wears OK lenses, he/she should stop using them a few days before attending the Magic Eyes class. The eyes will start reverting back after 24 hours and after a week the eyes will essentially be back to normal. Your child may experience great changes in vision, especially if the lenses were expected to correct more than -2.00 D to -4.00 D. This can sometimes cause a crisis of confidence because one day he/she will appear to be making great progress but the next day will appear to be back to square one. It is important, therefore, to be aware of this and focus more on the effort the child has made. 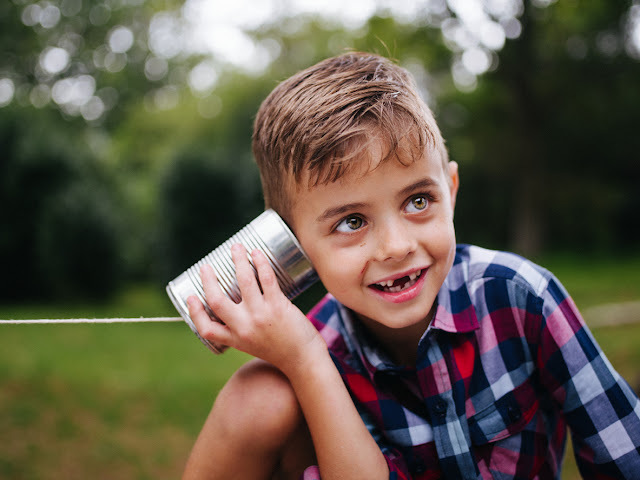 It is also best to start this project at the beginning of a long holiday period, so that the child has plenty of time to adapt.